We are into Manufacturing and Exporting high quality Semi Automatic Pad Printing Machine. These machines are used for printing Electronic & Electrical Parts, Auto mobile Parts, Gift Items, Home Appliances etc. 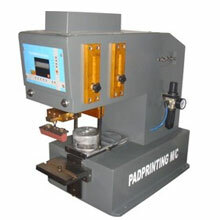 In order to meet ever- evolving needs of our valuable clients all over the nation, we are offering a vast spectrum of Semi Auto Pneumatic Pad Printing Machine. Our machine is capable of printing Electronic & Electrical Parts, Auto mobile Parts, Gift Items, Home Appliances. The offered variety is used in pen barrels, pencil body, glass and plastic, cosmetic bottles, tube light chokes, tube light holders, calculator keys, plastic toys, mugs and other such applications. Our product range is available in various specifications in order to meet the specific requirements of our esteemed clients.